"Old West Values" because we have roots here, in a part of the country that’s known for authenticity and hard work. "New West Vision" because we’re always looking to the future, to ensure we’re in step with your needs and priorities. EXPERTISE. VISION. DEDICATION. RESULTS. These are things that matter to you, and they’re the same principles that have helped Pfister Land Company, LLC become known as one of the premier real estate firms in the West. We represent buyers and sellers throughout the west on real estate transactions. Pfister Land Company, LLC is currently licensed and active in Alaska. Please contact us if you are interested in buying or selling farm, ranch, legacy, or sporting properies. Pfister Land Company, LLC is currently licensed and active in North Dakota. Please contact us if you are interested in buying or selling farm, ranch, legacy, or sporting properies. 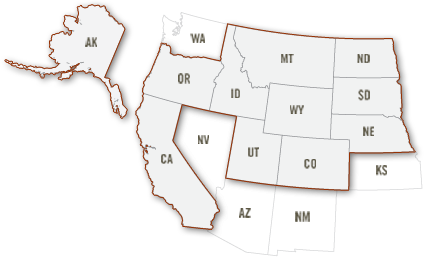 Pfister Land Company, LLC is currently licensed and active in Idaho. Please contact us if you are interested in buying or selling farm, ranch, legacy, or sporting properies. Pfister Land Company, LLC is currently licensed and active in Nebraska. Please contact us if you are interested in buying or selling farm, ranch, legacy, or sporting properies. Pfister Land Company, LLC is currently licensed and active in California. Please contact us if you are interested in buying or selling farm, ranch, legacy, or sporting properies. Pfister Land Company, LLC is currently licensed and active in Utah. Please contact us if you are interested in buying or selling farm, ranch, legacy, or sporting properies. Pfister Land Company, LLC is currently licensed and active in Colorado. Please contact us if you are interested in buying or selling farm, ranch, legacy, or sporting properies. Subscribe below to keep up to speed about listings and current market information.